Home » an academic » Facts » Human Body » kids resources » Knowledge » Myths » Science » What is an Adam's Apple? What is an Adam's Apple? Ever wonder why your dad's voice is lower and deeper than your mom's? It's mostly thanks to his Adam's apple, that telltale bump on the front of a man's neck. An Adam's apple is made of cartilage, the same flexible substance found in your nose. As a boy gets older, his larynx (lar-inks), or voice box, starts to get bigger and the surrounding cartilage grows and hardens with it. In some men, the cartilage sticks out and becomes a bump you can see. That's the Adam's apple! 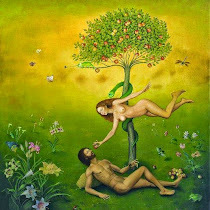 The Bible tells about the Garden of Eden, and Adam eating the apple that Eve gave him. To many people, the bump in a man's throat looks like a piece of swallowed fruit. Your vocal cords are muscles inside your larynx. The shorter chords produce high sounds, while the longer ones make lower sounds. As boys and girls grow, so their voice boxes and vocal chords. Boy's grow bigger, so their voices end up lower and deeper. Because the larynx grows so quickly as a boy matures, his voice sometimes breaks or cracks. After a few months, this stops. Thank you for reading What is an Adam's Apple? posted on the website Kwentology if you want to redistribute this article please include the link as the source. Have some kuwento to share? Contact us!